The bicentennials of the American revolution are well behind us, but the simple stories of Jefferson, Washington and Franklin and the glory of July 4, 1776 celebrated then still comprise the heart of the American founding myth. 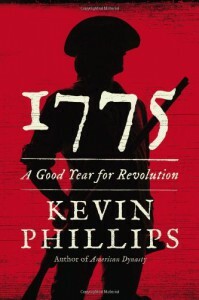 Kevin Phillips' 1775: A Good Year for Revolution is exciting not because he argues that we are celebrating the wrong year, although he is persuasive that the key decisions leading to independence were made in late '74 and in '75, but because he illuminates so much revolutionary activity under emphasized or forgotten in the conventional accounts. 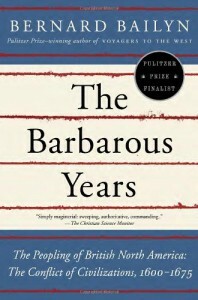 Phillips was a political activist before he started writing history, and he begins by analyzing the growth of tensions leading to revolution as if it were a political campaign: he breaks down the demographics, cross-referencing the economic, religious and political issues that led each group to lean to one side or the other. It is much more nuanced than the standard list of economic grievances I am used to seeing in general accounts. These details become important throughout the book, as it becomes clear that the revolutionary war is also a civil war, with many military engagements fought solely among Americans on one side of the Atlantic, and grave political disagreements strongly impacting British ability to project military force from the other side of the Atlantic. The second Lew Archer novel. Plot and thematic structure are not as tight, but still a great read. The focus has shifted from greed and the direct pursuit of wealth to family (or in some cases couples). Archer gains a little back story, depth and flaws: he is less the personification of fate and more an angry and lonely man whose personal choices drive parts of the plot. The primary corruption here involves the ways parents twist their children's love, and lovers exploit each other. 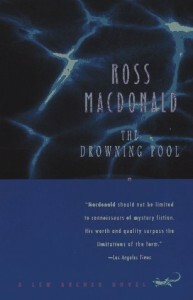 More early Macdonald: the first of the Lew Archer novels. This is a California noir in the Hammett-Chandler tradition. The prose is bleak and hard, like the landscape, yet it gives rise to florid palm trees of metaphor The cynical patter snaps. Diogenes would find more than the climate familiar; there is nary an honest man in sight. I think this is one of the best American crime novels. The plotting is much tighter than Chandler, and the characters deeper. The ending not only yields surprise after surprise, but completes a panorama of a California after the war grown rootless and corrupt. 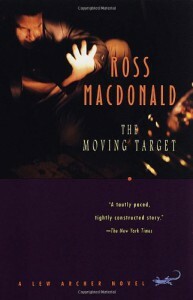 All of noir is cynical, but Macdonald connects more dots. 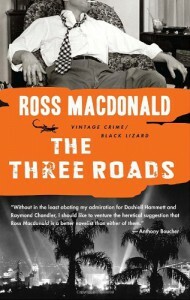 Early Ross MacDonald, and a quite unusual noir. The first third of the book seems like a totally different genre of mystery: a psychoanalysis of a man who suffered amnesia after the shocks of having his carrier sunk under him in WW2, followed by finding his wife murdered in the bedroom the day he got home to the states. The descriptions may be California noir, but the characters--patient, girlfriend and analysts--are intellectual, brooding, deeply introspective. The action is simply analysis: painstaking, endless talking about scraps of memory and half forgotten dreams to tease out another fragment of the past. It is well done, but it is not what any fan of Chandler would have been expecting. Then an analyst hands the patient a news paper story about the murder of the wife he had not remembered until yesterday, and the novel explodes. As the patient searches the streets of LA for clues, and then a murderer, the frantic physical action parallels a series of revelations that destroys what the patient, and to an extent the reader, thought they knew of his life. It is a good mystery, and the psychoanalytic material fits in well and drives some of the plot. John Nichols' New Mexico trilogy, written in the 70's, is a tragicomic, magic realist, panorama of a county in northern New Mexico similar to Taos. The first two books, The Milagro Beanfield War and The Magic Journey, present the old Hispanic farming communities (and to a lesser extent the Native American pueblos) in conflict with the Anglo community and economic development. The first is for me a classic, and the second nearly as good. 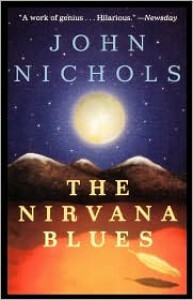 The third novel, The Nirvana Blues, tightens the focus to a single point of view character amid a single community, as development has driven all but anglos out of the town of Chamisaville. In part, the novel is a satire of a community where relentless development is overlaid with hippie and new left nostalgia as well as rampant New Age spirituality. The minor characters thus skewered are hilarious, and yet completely familiar to those of us who live in the area. 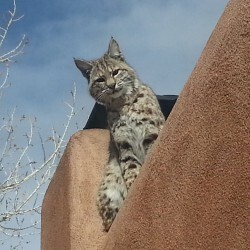 Northern New Mexico has not changed so much that you can not still find counterparts to everyone in the trilogy. The story of the main character transcends the satire. Joe Miniver is a left-liberal everyman who puts $12,000 into a drug deal in an ill-fated attempt to gather funds to build his dream house. The deal quickly falls apart, ruining his marriage, his character and his life. As he becomes increasingly desperate to save something from the mess of plots and counterplots, threats and bribes, adulteries and betrayals, the book becomes more hilarious as it becomes more appalling. Nichols humor always has a bite of political outrage, but here the betrayals, especially within the family, are so raw and personal that Miniver all but forfeits the minimal sympathy the main character must command to keep the humor from boiling away. And then the next passage pulls you back in with unexpected generosity, or self-lacerating humor, or eve a wild encounter that will forever fortify you for the next time a conversation turns to the angels among us. The conclusion is beautiful, sad, disturbing, and of course, very funny. I read science fiction not just for the joys all fiction brings, but also for the wonder: the speculation about the strangeness of the universe, and where technology and the human spirit can take us. From the beginning, physics has been the foundation of these speculations, and physicists among the leaders in writing mind-blowing SF. But 20 years ago the torch got passed to computer scientists and pure mathematicians, not so much because of the emergence of the internet, but because of the dawning realization of the impact of AI, and the possibility of the singularity. Do Jeeves and Bertie Wooster really need another introduction to polite society? 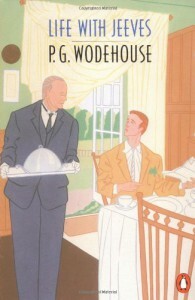 The TV series and Wodehouse' general reputation are not at all misleading. The books are very funny, very well written, but repetitive in large doses. The stories are all narrated by Bertie Wooster, who is not unreliable as much as clueless. The humor comes from the distance between Bertie's description, and what the reader can surmise, as well as from the zany plots and delicious word play. This omnibus edition contains three novels, The Inimitable Jeeves, Right Ho, Jeeves and Very Good Jeeves. Reading them one after another got quite repetitive: plot set-ups and even gags get reused, and there is little variation in tone. A sweet and fluffy dessert but not a satisfying full meal. The first two novels are nearly short stories strung together, and could easily be read a few chapters at a time at uncertain intervals in between bouts of heavier reading or (gasp) attention to real life. I thought I knew quite a bit about the founding of the original American colonies: stories about Jamestown, the Mayflower, the Dutch in New York, are fed to us from our first days in school, then deconstructed, respun, and illustrated by movies starring, if we are lucky, Daniel Day-Lewis. I even taught once a seminar on the ideological origins of the U. S. constitution. I had no idea what I was missing.